Gold nanoflowers grown in starfruit juice are promising agents for photothermal cancer therapy. When injected into a tumor and irradiated with near-infrared laser light, the nanoflowers heat up and kill the cancer cells around them. Although photothermal therapy is an established idea, the agents developed so far have had drawbacks, explains Enyi Ye from the A*STAR Institute of Materials Research and Engineering, who co-led the current work. The challenge is to achieve high efficacy, stability and biocompatibility in the same nanocrystal, which all relate to the way the nanocrystals are grown. A nanomaterial's shape dictates its light capturing ability. During the synthesis of nanocrystals, when gold ions are mixed with a reducing agent to precipitate crystal formation, chemicals called capping agents can be added to direct the crystals' growth. "Capping agents will attach to different facets of the nanocrystal nuclei," says Ye. "They regulate the crystal's growth and stabilize the final nanocrystals." However, conventional capping agents are not biocompatible, so they need to be eliminated before the nanocrystals are used for therapy. Removal, however, can be difficult and may damage the nanocrystal's shape, impairing its light absorption. Ye and his colleagues tried an alternative 'green' approach, using a natural material they hoped would contain the biological equivalent of capping agents. This would negate the need to remove the compounds before nanocrystal injection into the patient. "I selected starfruit juice because it is available all the time in tropical areas, and because starfruit is rich in vitamin C, which serves as the reducing agent, and polyphenolic antioxidants," says Ye. As the team had predicted, the vitamin C initiated and directed nanocrystal growth, and the polyphenolic compounds acted as capping agents, coating the flower-shaped nanocrystals with a stabilizing, biocompatible surface. 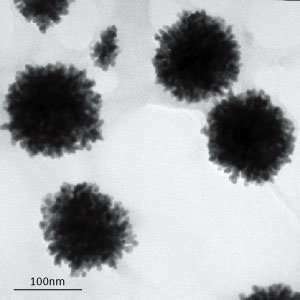 The gold nanoflowers showed strong near-infrared light absorption, and were non-toxic to cells. When 808 nanometer near-infrared laser light was shone on cells mixed with nanoflowers, 30 seconds of illumination killed every cell within the laser spot. In tests with mice, photothermally-treated animals' tumors gradually disappeared—whereas in animals given either laser irradiation only, or nanoflower injection alone, the tumor continued its rapid growth. The team now plans to take the research in two directions, says Ye. "We will continue to develop green methods to prepare multifunctional nanocrystals. We would also like to further exploit the practical applications of the gold nanoflowers in areas such as wound healing and bacterial infection control," he says. The real problem seems to be the ability to ensure the nanoflowers can spread enough to cause damage to all the structures of each cancer cell without creating the situation in which "sleeper agent" types of proteins or what have you can come back later with renewed vigor with the ability to fight off chemotherapy. The benefit here I perceive is it's not chemotherapy, it's a thermal process that kills the cells. That would make it significantly more difficult for the cancer to evolve a defence mechanism.